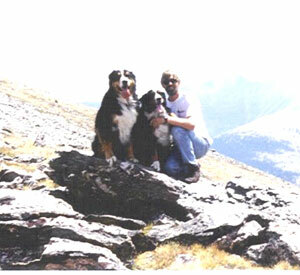 Tilla was our first Berner - we brought her with us from Germany when we moved to Colorado in 1992. She was such a sweet girl that we had to get another -- and another...and... a logic she always found hard to follow! 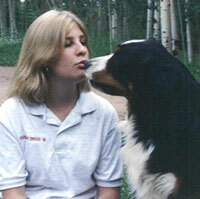 We first saw Tilla when she was 4 days old, a tiny puppy barely filling our hands. We named her Atilla, because then we could make corny jokes about Atilla the Hund. However, this was the D-worf (litter), and we had to pick a name beginning with "D" ... so Deborah vom Erlengrund she came to us, but Atilla the Hun---gry she remained throughout her life! Unlike most of our overly trusting girls, Tilla was a sincere watch-dog with an alarming and serious bark and an uncanny ability to read into the intentions of strangers. While visiting in Denver, we saw a grassy park and decided it was a good place for an impromptu picnic. Shortly after we settled down, a very dangerous looking person began to walk directly toward us; however, when Tilla stood up with bristling neck hair, he suddenly veered away and disappeared. 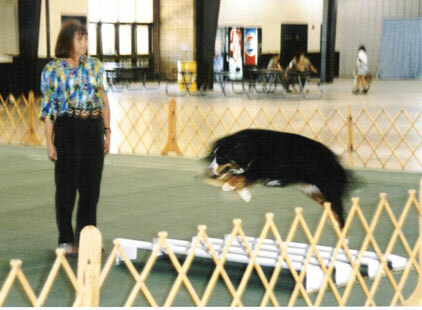 After being "properly introduced," however, no other dog could match gentle Tilla. 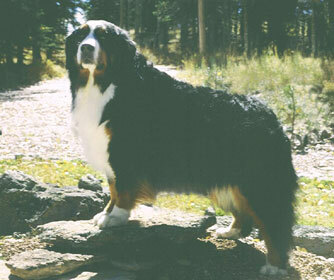 Tilla was quiet, preferring to play the role of humbledog and willing to allow our other Berners to vie for political supremacy while she, having never been challenged (how can one challenge a dog who refused to acknowledge the fact?) cooly surveyed the field of battle.